HAVE YOU EVER WANTED TO GET THE PERFECT RECIPE FOR A DELICIOUS 'PANINO'? HAVE YOU EVER WANTED TO GET THE PERFECT SHOT TO SHARE WITH YOUR FRIENDS THROUGHOUT THE SOCIAL MEDIA WITH YOUR SMARTPHONE? WELL, THEN THIS IS THE PERFECT EVENT FOR YOU. 5 EVENINGS HOSTED BY ME AND ALESSANDRO FRASSICA, WHO WILL GUIDE YOU TO LEARN AMAZING RECIPES OF HIS FAMOUS RECIPES AND I WILL GUIDE YOU ON HOW TO GET THE PERFECT LIGHT, DISHES COMPOSITIONS AND THE RIGHT APPS TO SHOOT BEAUTIFUL IMAGES WITH YOUR SMARTPHONE AND SHARE WITH THE WORLD. 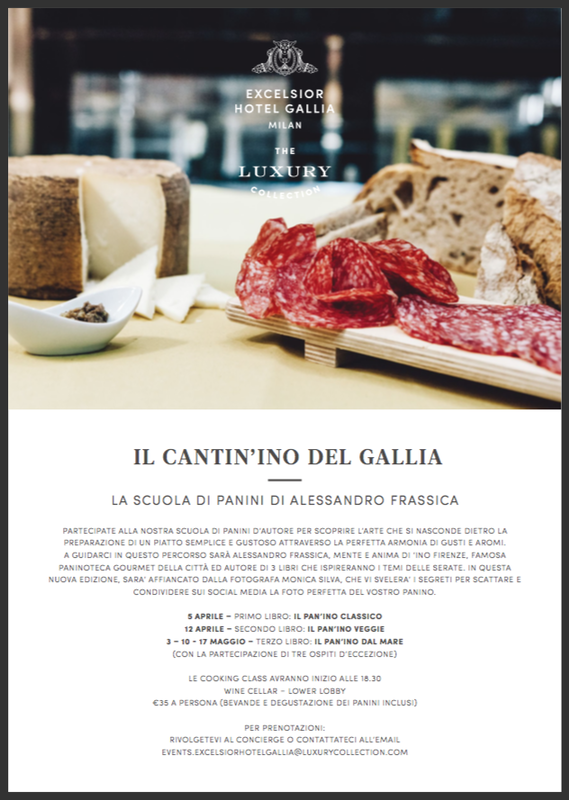 "PARTICIPATE TO OUR SCHOOL OF PANINI GOURMET TO DISCOVER THE ART THAT IS BEHIND THE PREPARATION OF A SIMPLE AND TASTY DISH THROUGH THE PERFECT HARMONY OF TASTE AND AROMAS. ALESSANDRO FRASSICA, MIND AND SOUL OF 'INO' FLORENCE, THE FAMOUS PANINOTECA GOURMET OF THE CITY AND AUTHOR OF 3 BOOKS , WILL GUIDE THE PARTICIPANTS TO INSPECT THE THEMES OF THE EVENING. IN THIS NEW EDITION, ALESSANDRO FRASSICA WILL BE ACCOMPANIED BY PHOTOGRAPHER MONICA SILVA, WHO WILL REVEAL THE SECRETS TO SHOOT SNAPSHOTS FOR A PERFECT PHOTO OF THE RECIPES TO BE SHARED ON THE SOCIAL MEDIA."